As a default, your audio source is the internal mic of the iPad/iPhone that you are using as the main switching device for Switcher Studio. If you want to use another audio source, then you will need to set up an external microphone(s) where needed. You can then connect the external microphone to an iRig Pre adapter by using an XLR cable. Lastly, plug the iRig Pre into your main iPad, and your audio will default to the external microphone rather than the iPad's internal microphone. 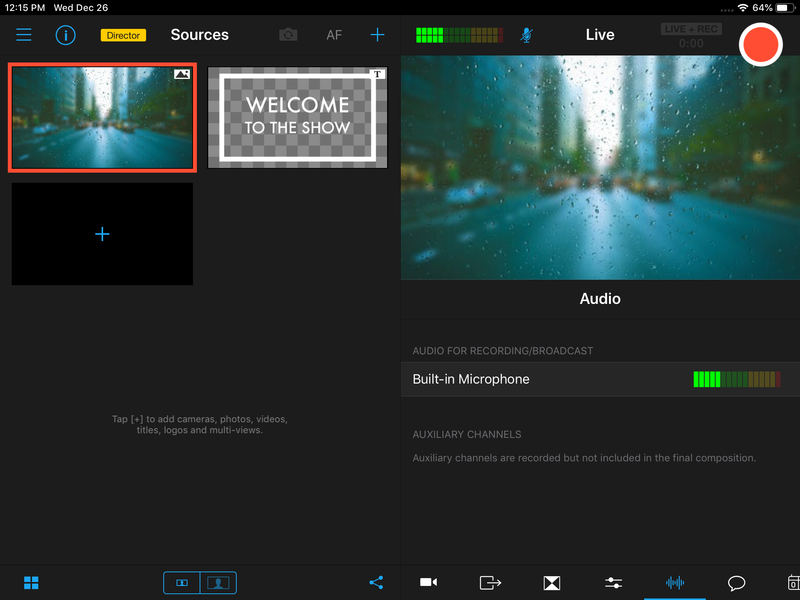 If you want to have multiple audio sources (such as using lavalier mics for an interview), you will need to connect your external audio sources to an audio mixer, which can then be plugged into your main iPad via an iRig Pre adapter. Here is a guide that will explain the process of using a mixer with Switcher Studio: https://switcherstudio-support.switcherstudio.com/article/129/how-do-i-use-an-audio-mixer. You can determine which source is connected at any time by checking in the Audio Tab. By default, this will be the Built-In Microphone.